No this is not the name of an obscure 1970’s band but a reference to last night’s dinner. 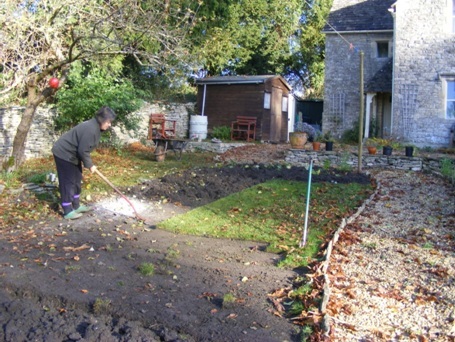 But first…..
Having been affected by the ‘Year without Supermarkets’ idea we were prompted to have a stay at home weekend and achieve a garden makeover and more. My veg garden is usually very productive but 2012 has proved to be the most difficult growing season I remember in nearly 40 years of gardening. In March/April it was so dry that Thames Water called a hosepipe ban just when my seedlings were coming through. This meant a second sowing of most things. Then it started to rain and rain and rain and….. Grey skies no sun and seedlings that refused to move until July which was the same time that a heavily pregnant rabbit decided to take up residence. Six rabbits later I just about scraped a few lettuce, a half decent potato crop and some good root veg. In this stay at home weekend we had a master plan to remove half the lawn and replace it onto the least productive area of the veg. garden, up against the wall. 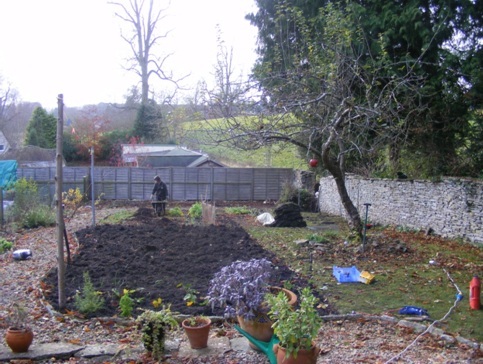 We then dug up a lot more lawn as the soil underneath seems fantastic. We now have 50% more productive garden as next season we plan to grow cake! As mentioned we have quite a few root veg left so we gathered a parsnip, some turnips, a celeriac, some carrots, an onion and a few potatoes (which we found growing in the compost heap). Along with some herbs and some chunks of Derek these were put into the stewpot to simmer away as we gardened. A good job as when the task was finished we were too tired to cook. Now really looking forward to using the new piece of ground, it really does look as if it will grow great cake. Already it has some crops on as we transferred our strawberry plants and a row of over-wintering onions which were where we moved the lawn to. I know you are wondering about growing cake. Well taking a leaf from our entrepreneurial granddaughter, we have come up with the Veg for Cake Scheme. Now how about that for a good idea?